The answer, it turns out, varies considerably across schools and even between classrooms. Aaron Talley, a language arts teacher at Lindblom Math and Science Academy in West Englewood who has contributed an op-ed to the Weekly, explains that teachers and principals consult CPS reading lists to varying degrees. Some base their curriculum off the books recommended on the lists, whereas others create independent reading groups that give students considerable leeway in what they read. CPS reading lists themselves are also a bit of a puzzle, owing to their varied usage and sourcing. In a statement to the Weekly, Dorsey Chambers, the CPS Library Coordinator, explained that the basic Recommended Reading List “features recommended newer books, with copyright dates in the past several years, which are quality, critically reviewed literature.” The Recommended Reading List is updated every other year and accompanies the Spanish Acclaimed Literature Summary for All (SALSA) and the Diversity Recommended Reading List. The Department of Literacy also releases specialized reading lists and resources, such as the Social Science Print and Digital Resource Library, which teachers adapt to changing state Social Science standards. Another example is the Power of Peace Reading List, which covers all grade levels and was created by the Department of Literacy and CPS librarians to highlight books that emphasize tolerance and conflict resolution. The three biennial reading lists are created by a team of librarians drawn from a larger pool of applicants every other October. They work together to determine the evaluation criteria, rubrics, priorities, and documentation for the reading lists in question. After reviewing five to ten books each month, the team reconvenes in the spring to select the titles to be placed on that reading list. The lists are then distributed to schools by librarians and the Department of Literacy, and presented to the Illinois School Library Media Association, a statewide consortium of school media specialists that develops best-practice guidelines and other professional development resources for school librarians. Despite the heavy involvement of librarians in the creation of reading lists, however, the lists are hardly the primary tool school librarians use. Tamela Chambers, for one, envisions herself as a sort of literary matchmaker. “We are champions of reading for pleasure, so generally when I interact with the kids, we chat about the things they like. My goal is the match them with the perfect book based on what they tell me.” Recommendations are highly individualized, and can be based on anything from past books a student has liked to their popular culture interests. For example, Tamela Chambers says, kids who like dramas and reality television are often recommended realistic fiction, which mimics the forms of structured plot and interpersonal conflict. The last book she had recommended was Maya’s Choice, by Earl Sewell, an author well-received by her students. In practice, however, reading levels are important determinants of what students read. Teachers sometimes use these structures to have students pick books from their assigned reading level shelf. As Talley explains, “Best practice says these aren’t to dictate what students should or shouldn’t be reading, but should instead help teachers attend to students’ needs.” Used properly, reading levels allow teachers to personalize each student’s reading assignments according to their skill level. Another tool teachers can use is Accelerated Reader. Students decide which books they want to read from the online database, and can take the online reading comprehension tests to get points, creating an incentive for independent reading. For librarians, reading levels are generally not prescriptive. As Tamela Chambers explains, “If the students are using books for research, you don’t want to give them something that’s too difficult, but when it comes to reading for pleasure, it’s for that kid’s comfort level.” Tools like Acelerated Reader often end up filling in the gaps at schools without a school librarian, in which students don’t have the same resources for learning how to choose books. School librarians also flesh out students’ exposure to cultural ideas. Gunn addresses holidays such as Halloween by including fifteen or twenty books that provide students with multiple perspectives on the holiday. A classroom teacher, Gunn notes, would be lucky to have even a couple of relevant books. For a sense of scale, Gunn explains that a large classroom library will maybe have 500 books, whereas a school library will have 10,000. 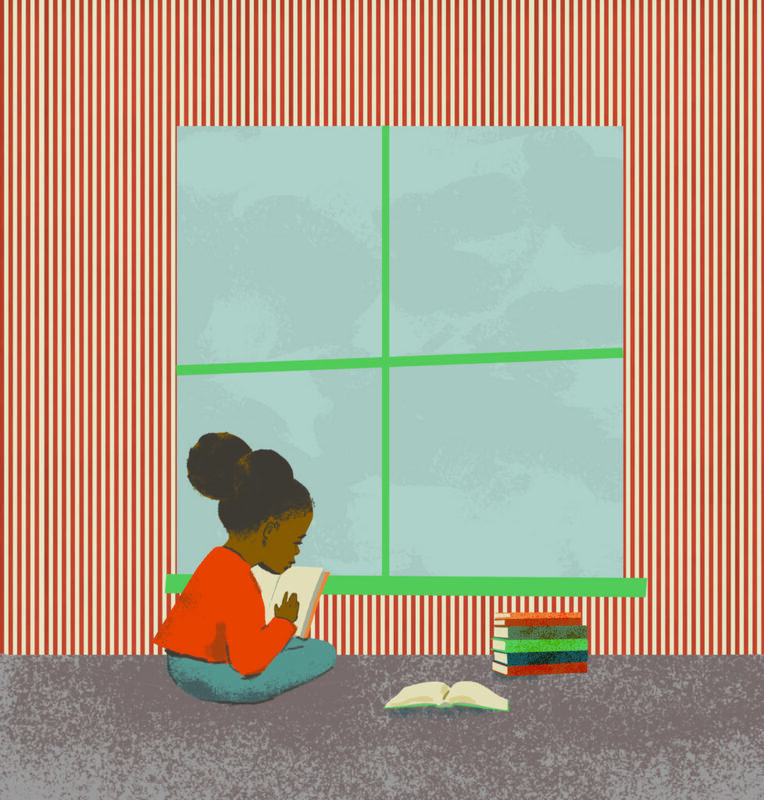 It’s school libraries that expand student exposure to books beyond the prescribed reading lists, and really encourage kids to read on their own. In spite of their importance, however, school librarians are a vanishing breed in Chicago. Only a quarter of schools have a school librarian this school year, and, as of 2015, among high schools that are at least ninety percent Black, there are only two school librarians remaining. Szyman adds, “A lot of schools have dismantled their libraries, they’ve put the books in classrooms, given them to parents, given them to other schools…we’ve got boxes of books from other schools in the back of our library.” The Department of Literacy, too, is seeing cuts. “It’s no longer a department,” she said. “It used to be twelve, fifteen people. It was wonderful. We used to have quarterly meetings, and we would share ideas.” The reading lists are still being created, but level of robust resources is not the same. Talley also notes that he has more freedom to build a reading curriculum that goes beyond the Western canon at Lindblom, a magnet school, than he did at the neighborhood school where he previously taught. Librarian Tamela Chambers and CPS Library Coordinator Dorsey Chambers both recognize the presence of standardized testing in classrooms, and independently note that reading lists are designed to support Common Core standards, while also aiming for diversity and quality. Testing also impacts school libraries in the schools lucky enough to have them. With CPS so pressed for money, individual schools face tight financial constraints, and testing cuts further into library budgets. Szyman recalls an episode a few years ago when the principal informed her that he had bought her a cart of iPads to use with the students. Szyman was very excited to incorporate the new resource into her lessons with students, but was never able to use the apps she had downloaded for them that summer because the iPads were constantly being used for round after round of standardized tests. Worse, she wasn’t able to buy as many books that year. “My library budget had gone to the iPads, which went to teachers for testing,” she said. As a former CPS area library coordinator, and retired teacher librarian and teacher, I wholeheartedly agree with the librarians regarding the significant impact good school libraries and librarians have on student achievement and fulfillment. It’s such a pity we are no longer valued accordingly. Sadly, the schools where children have the least access to books in their homes/communities are also the schools with the fewest libraries. 90% of those kids interacting with the juvenile justice system are functionally illiterate. The average middle class child has 30 books, in low income communities there is one book per 300 kids (not a typo.) In January, 2014, several Northside moms banded together to create BooksFirst! (http://www.booksfirstchicago.org), which operates with no funding to collect and deliver gently loved kids’ books to Chicago’s most underserved schools. Thus far, we have delivered over 60,000 books to 35 schools. We are challenging kids to meet standards without supplying them with the basics…books as gateways to literacy and learning.